Shy little flower fairies peeking out from buds and blossoms are just the thing to bring a little magic to your day. So why not paint your very own flower fairy friends to decorate your window-plants or garden flowerbeds? Tint the fairies’ frocks with soft rainbow hues. Glaze their fragile wings. Help them to shimmer with a dazzling touch of glitter glaze. Then take them to the garden, breathe some magic into them… and watch them spot a flower and flutter away! 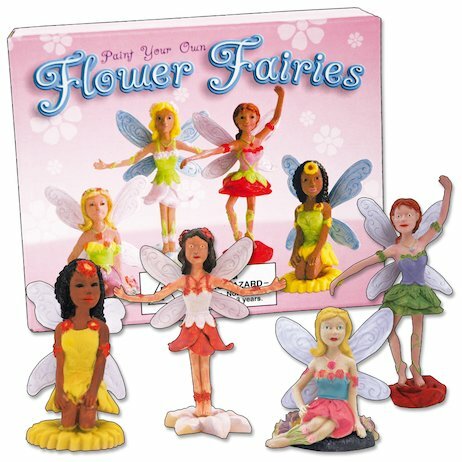 Kit contents: 4 flower fairy figures, 8 paints, glaze, glitter glaze and brush.